The New Humanitarian | "People may be dying in their homes and we don't know about it"
"People may be dying in their homes and we don't know about it"
Fighting in parts of the Somali capital, Mogadishu, has trapped many residents and made them inaccessible to the help they need to survive, civil society sources said on 9 June. "There are people who have been stuck in their homes for the last three weeks; they are terrified, hungry and have no access to any help," Asha Sha'ur, a civil society activist, told IRIN. She added: "Those who are left in the city have little choice except to wait and hope that the violence around them does not get closer. Some of the trapped residents cannot afford to flee while others are too afraid to leave Mogadishu." 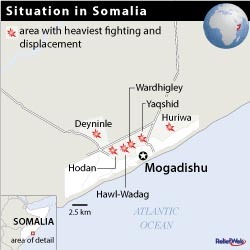 In recent weeks, Mogadishu has been a battleground for troops loyal to the weak government of the western-backed President Sheikh Sharif Ahmed and a variety of armed opposition groups, chief among them al-Shabab, which now controls much of the south and centre of the country, where it has imposed sharia law. The fighting has displaced almost 120,000 people since 7 May. Sha'ur said they had received reports of desperate people stuck in their homes for days "with no access to any assistance, whether it is food, water or medical help; people may be dying in their homes and we don’t know about it". Civil society groups were trying to visit some of the areas on 9 June "to ascertain the condition of the people and see where we can help", Sha'ur said. In past conflicts, people fled to other areas of the city that were safe, "but now there are increasingly no safe places left to seek refuge", she said. "The trapped residents need most urgent help." Muhammad Nur Ga'al, deputy head of the coalition known as Civil Society in Action, said the humanitarian situation for both internally displaced persons (IDPs) and those still in the city was becoming more and more precarious. "War, hunger, disease and rains have combined to create the worst humanitarian disaster this country has seen," Ga'al said. He said the little help that was getting through was not enough to meet the massive needs of the people. He said insecurity was the biggest obstacle in reaching the needy, but that agencies should be more creative in how they accessed the population. "They have to come up with new ways of reaching those who need them," Ga'al said, adding that one option would be to involve the Somali business community and local agencies, although the business community was already providing some help to the affected populations. Ga'al called on the international community to scale up humanitarian assistance "in any way they can". He added: "If the situation does not improve we will be faced with a humanitarian catastrophe comparable to that of 1992." Meanwhile, the UN Refugee Agency (UNHCR) and the UN Children's Fund (UNICEF) have expressed concern over the effect the escalating violence in Mogadishu is having on civilians and the human rights violations being committed. “Yet again, parties to the conflict in Mogadishu fight with no regard for the safety of civilians, in clear violation of international humanitarian and human rights principles,” Guillermo Bettocchi, the UNHCR Representative for Somalia, said in a joint statement on 9 June. He called on the international community to intervene and end “this self-perpetuating culture of impunity, including by establishing a credible and independent process to investigate and eventually prosecute those responsible for the apparent war crimes and crimes against humanity that Somali civilians have and continue to be exposed to”. The agencies said many of those killed or injured were women and children. “Parties to the conflict must realize that the main victims are their own children, who are being killed, maimed or displaced by the fighting, some even recruited to take part in the fighting,” Hannan Sulieman, acting UNICEF Representative to Somalia, said. According to UNHCR, an estimated 117,000 people have been forced to flee their homes in Mogadishu since early May.